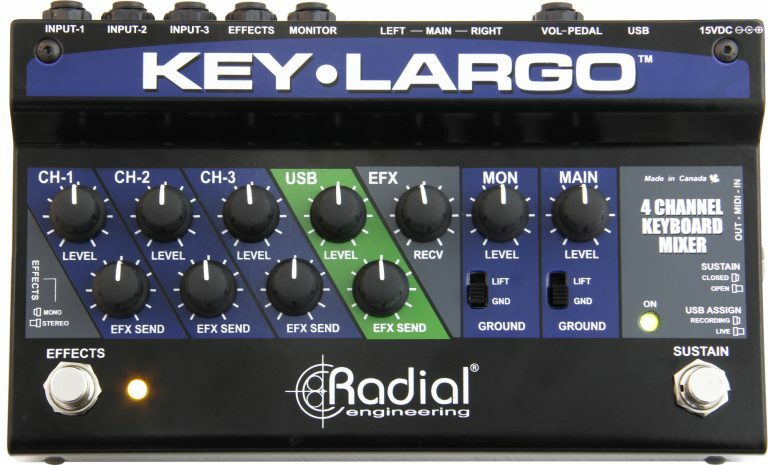 The Key-Largo is a unique and powerful device that combines a multi-channel keyboard mixer with a USB audio interface, while providing the ability to control elements of the performance with footswitch control. 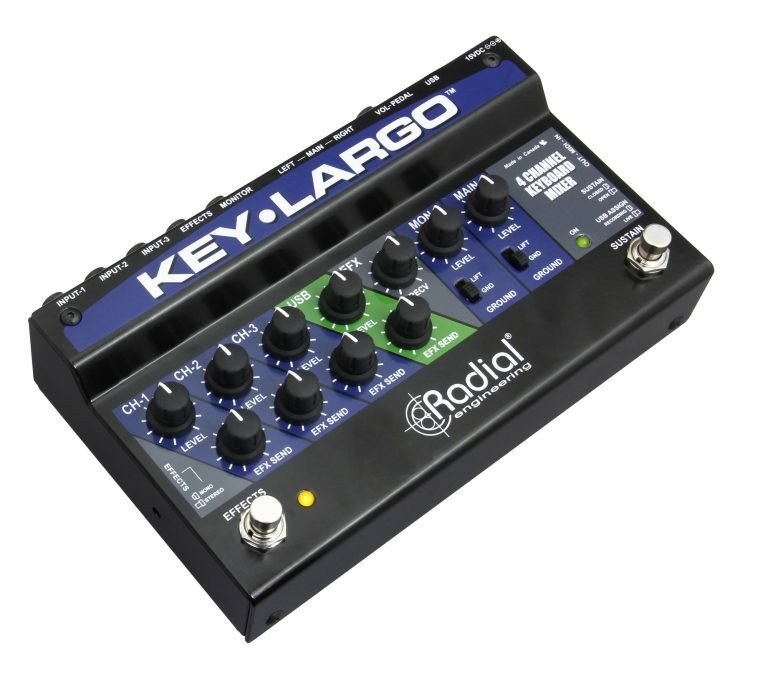 Designed for stage use, the Key-Largo allows you to connect up to three stereo keyboards, effects and volume pedals, and a laptop computer via USB, managing all these signals to send a balanced audio feed to a PA system for a seamless performance on stage. 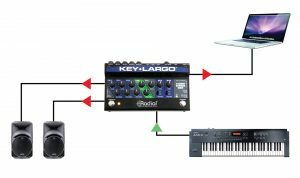 Three stereo analog inputs feature individual volume controls to balance levels, and each can be sent to a shared effects loop to add reverb or delay in an instant using a dedicated footswitch. 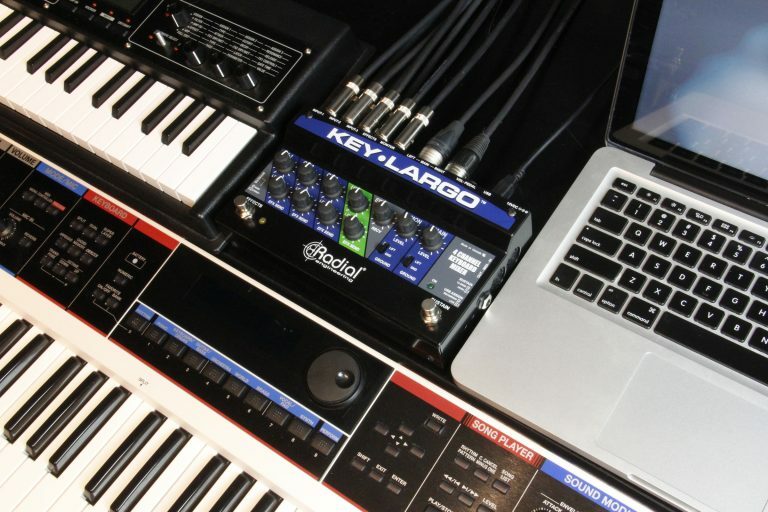 A USB connection allows laptop computers to be integrated into the setup for control of soft-synths, and a built-in sustain footswitch and connections for a stereo volume pedal provide additional ways to control your performance. 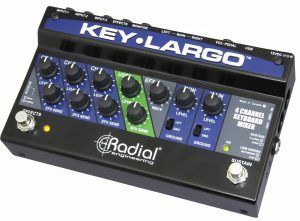 A switch-mode power supply inside the Key-Largo elevates the rail voltage to 24 volts for extra headroom to handle the most dynamic digital keyboards and the hottest analog synths without fear of overload or distortion. 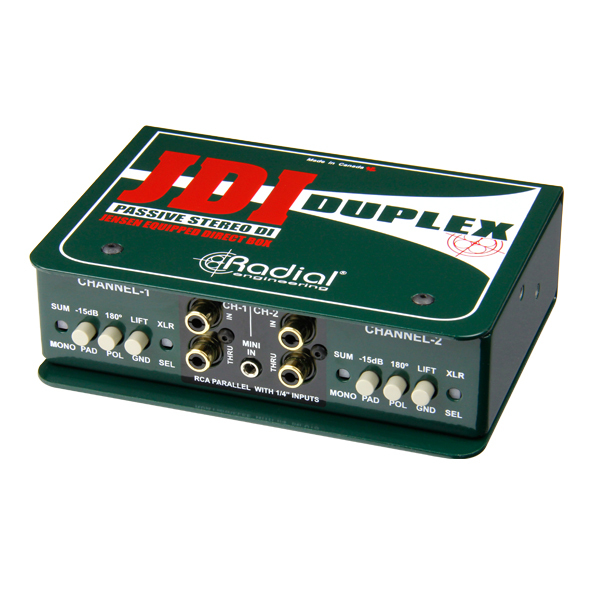 This is paired with 24bit/192kHz digital audio converters for high quality audio over USB when playing soft-synths or pre-recorded tracks. 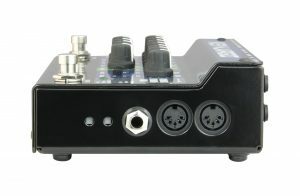 To eliminate noise when connecting multiple devices on stage, the main outputs are transformer-isolated to eliminate hum and buzz from ground loops, and all outputs are equipped with ground lift switches to further reduce noise. 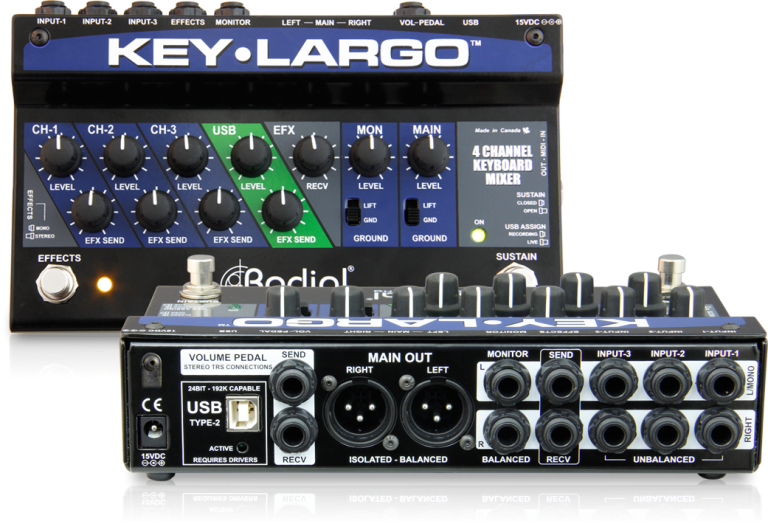 The Key-Largo effortlessly mixes multiple keyboard outputs down to a stereo feed for the PA system over XLRs. Add more excitement to the performance with a switchable effects loop and master volume pedal. 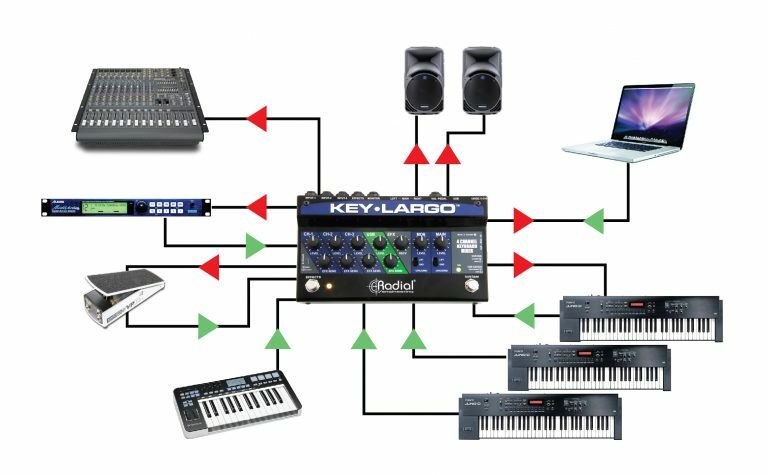 The Key-Largo can take the MIDI output from a controller to play a soft-synth on your laptop. 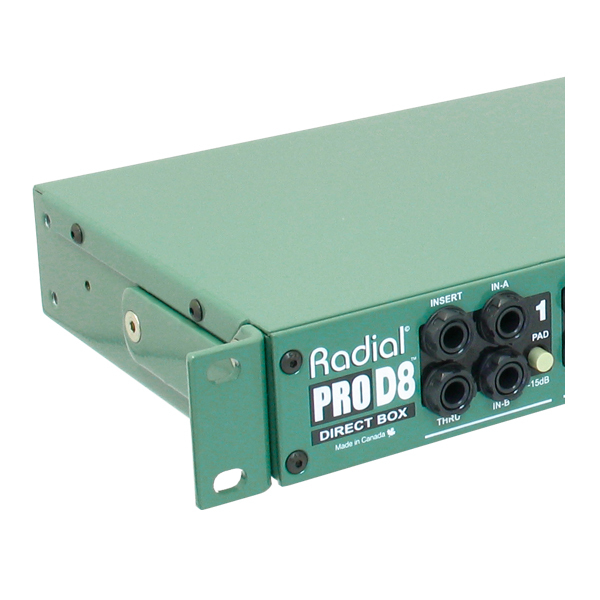 High quality digital-to-analog converters give you great sound quality on local monitors and at the PA system. 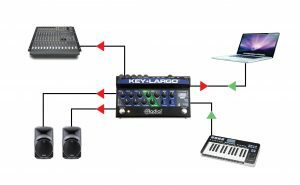 Mix three keyboards together with the output of a laptop soft-synth, making the Key-Largo the center of your performance setup. Connect a ¼” cable to the footswitch input on your main keyboard to utilize the Key-Largo as a sustain pedal, fully implementing the many features of this powerful pedal. 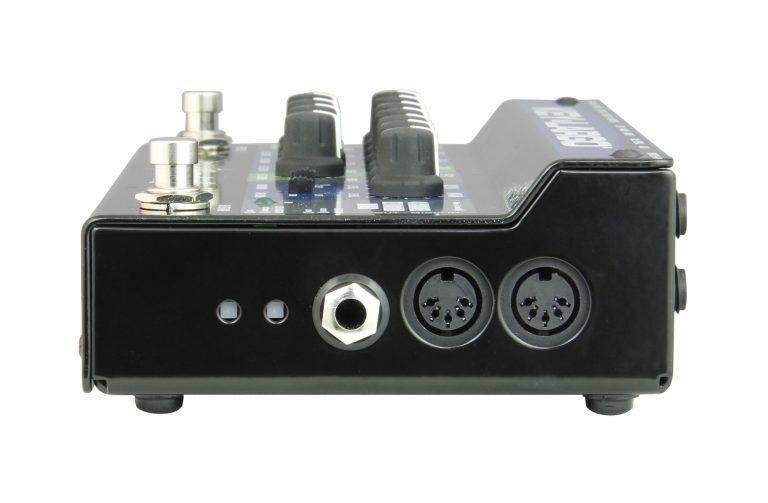 24bit/192kHz converters provide more than just high quality playback on stage, the Key-Largo can also be used to record pristine tracks using your favorite audio program. 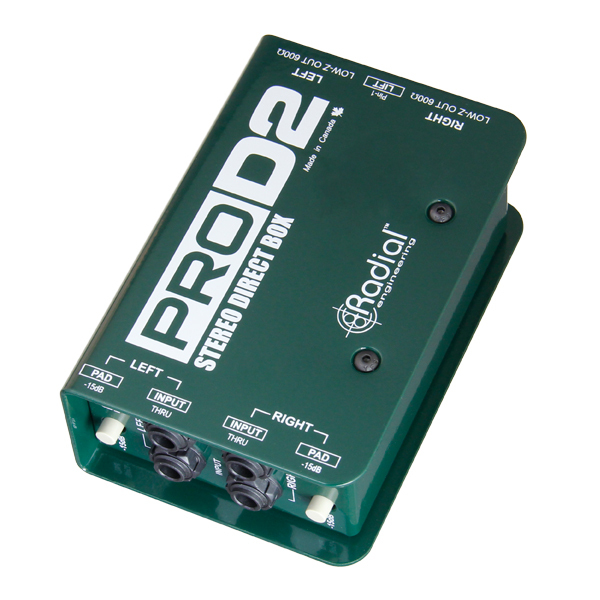 This allows you to easily record studio-quality tracks while on the road, or to capture your live performance. "The Key-Largo simply does everything you need and nothing you don't... For 90 percent of my gigs, I'm going Key-Largo and never going back. It's as though someone really looked at the needs of us keyboard players, listened, and said, "Oh, uh, right. Someone should make that." Well, someone did, and their name is Radial." "It's refreshing when a seemingly "been there, done that" recording situation is given a new treatment, with quickly obvious benefits. 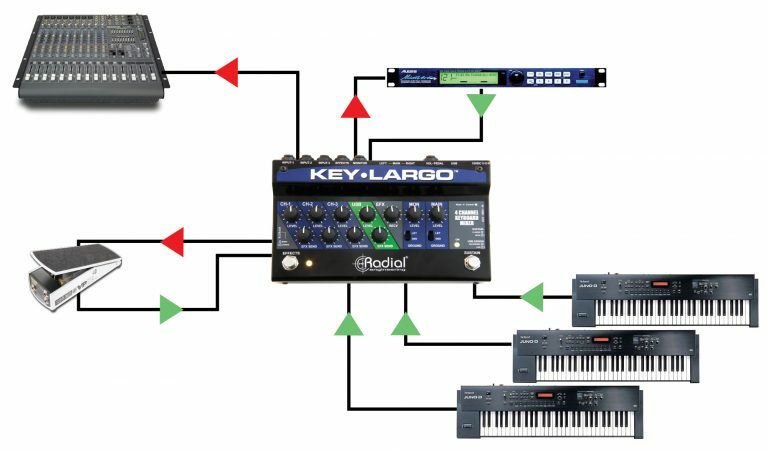 If your studio or stage work includes keyboards and virtual instruments, you may find yourself wondering how you got along without the Key-Largo." 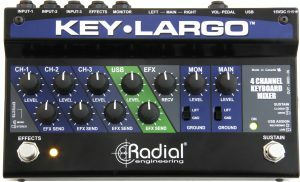 "If you're a keyboardist, a modular synthesist or a guitarist using a computer as part of your setup for stage or studio then the Radial Key-Largo may well be your key to a compact, efficient, high-quality system that will be quick to set up and to break down. 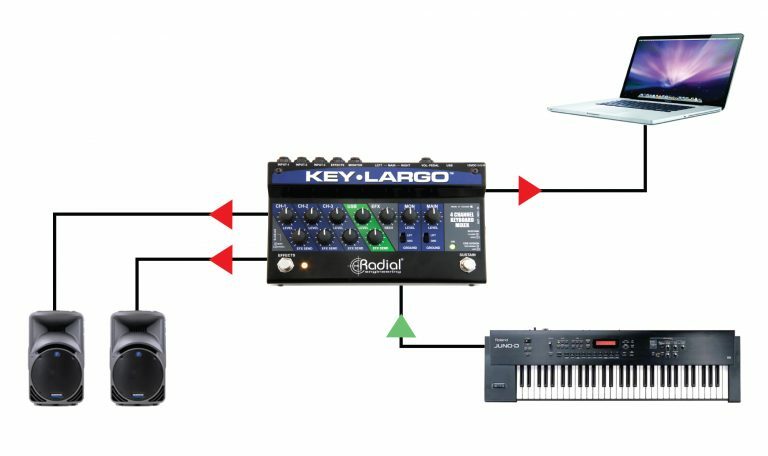 I can't think of an easier and more cost-effective way of integrating a computer, MIDI and musical hardware and software on stage or in the studio." "You’ll always have the keyboard mix you want, with the ability to adjust it on the fly if need be. 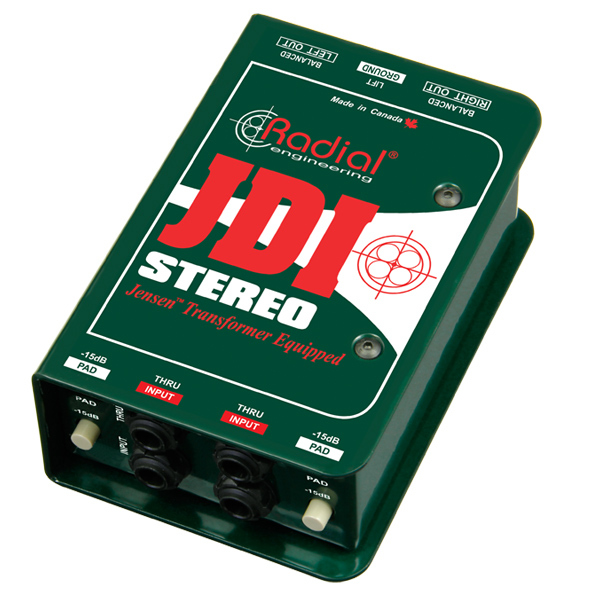 In all, this is another standout product from Radial Engineering and one that certainly fills a void." 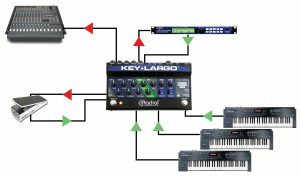 "Key Largo is a well-thought-out, flexible and high-quality tool for the performing/recording keyboard/synth musician that, besides the lack of headphone monitoring, fills the DAW interface slot on top of integrating a multi-instrument setup." "The Key-Largo keyboard mixer by Radial is my new best friend! I plugged in 2 stereo keyboards, my stereo iPad and my Seaboard, a standard MIDI keyboard through the DIN port and all I could do was smile!" "The Key-Largo by Radial is the Swiss Army knife portable keyboard mixer, for any player and any rig set up. I love this thing."